In 2017, the Nature Conservancy of Canada (NCC) protected 150 acres (60 hectares) of exceptional habitat on the Cascumpec Sandhills, an island near Alberton, PEI. 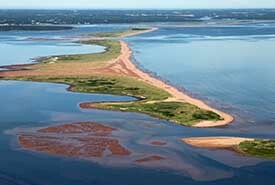 NCC’s Cascumpec Sandhills property, and its neighbouring Conway Sandhills property, are part of a system of island barrier beaches on the northwest shore of PEI. The Cascumpec Sandhills are characterized by a sand dune and marram grass ecosystem that separates Cascumpec Bay and Alberton Harbour from the Gulf of St. Lawrence. The Cascumpec Sandhills property was donated to NCC by Ian Oulton. This conservation project was supported with funding from the Government of Canada’s Natural Areas Conservation Program and Ecogift Program. The American Friends of Nature Conservancy of Canada also contributed generously to this project. This piece of coastal wilderness is a natural treasure in Canada’s most densely populated province.